Editor, Jennifer Ward jennifer.ward@aceville.co.uk 01206 505420 Deputy Editor, Melissa Hyland melissa@aceville.co.uk 01206 505423 Editorial Assistant, Sian Whitehead sian.whitehead@aceville.co.uk 01206 505917 Contributors Emma Thompson, Kayleigh Rattle Publishing Director, Helen Tudor Advertisement Sales Hannah Suttling hannah.suttling@aceville.co.uk 01206 505495 Anna Spilsbury anna.spilsbury@aceville.co.uk 01206 505932 Sarah Collins sarah.collins@mspublications.co.uk 01206 506255 Jackie Weddell jackie.weddell@mspublications.co.uk 01206 506221 Jo Bluck jo.bluck@aceville.co.uk 01206 506253 Art Director Phil Dunham Designers Gemma Eales, Hannah Kemp, David Haddington, Cat Morton, Richard Allen, Fiona Palmer and Alice Halfpenny Ad Production Angela Scrivener Photography CliQQ Photography www.cliqq.co.uk Models Jessica Munro, MOT Models, Laura Coleman and Daisy Pettinger, Nevs Olivia Coe, Ruben Coe, Jack Gledson Accounts Denise Bubb 01206 505958 Subscription Enquiries/ Back Issues 01795 592967 Website Enquiries webmaster@sewmag.co.uk Newstrade Sales Marketforce 0203 148 3300 Marketing Manager Andrea Turner Subscriptions Executive Jo Gould sew@servicehelpline.co.uk Published By Aceville Publications Ltd 2016 21-23 Phoenix Court, Hawkins Road, Colchester, Essex CO2 8JY © Aceville Publications Ltd All projects from this issue and the FREE online patterns are for personal home use only and cannot be sold or used for commercial purposes. All patterns that are featured in Sew are reproduced in good faith that they do not infringe any copyright. The publishers are not responsible for any safety issues arising from any items created from projects contained within Sew magazine. While all possible care has been taken to ensure the accuracy of all projects, we are not responsible for printing errors or the way in which individual work varies. Please read instructions carefully before starting construction. Have you made any stitchy goals for 2017? I’m well overdue some quality time with my sewing machine, and am itching to sew so many garments! I’m a firm believer in always wearing exactly what you want to, and sewing allows you to do just that. Comfort is always a priority for me but in recent years, I’ve tried to avoid wearing baggy clothes. Whatever your shape, the garments in this issue will help you get the right fit for you. Your FREE Simplicity 1653 pattern is from the Amazing Fit range and will soon become a wardrobe favourite. Fiona Hesford of Sew Girl has designed a chic top and skirt combo (p26) and no-pattern skirt (p22) that are so easy to sew, while resident designer Amanda Walker has created a stunning peplum top (p38). It features a lovely pleated detail, which we sent to the folk at Ciment Pleating to incorporate into the design. It was fascinating to learn about the process; read Ed Assistant Sian’s piece on p36 to discover more about this technique. Sewing your own undies has been on our stitchy radar, so we’re thrilled to give you 50% off two fabulous Simplicity patterns from the Madalynne collection. We caught up with blogger Maddie and two Sew readers who have stitched their own bras on p40. Or, if you’re dreaming about loungewear, Fiona Hesford’s lovely nightie (p46) ticks all of the right boxes. Regardless of how you feel about February 14th, it feels good to spoil our loved ones – which is why at Sew HQ we love the idea of Palentine’s day too! Our tea strainer embroidery (p74), heart wall hanging (p70) or heart cushions (p54) would make lovely gifts. Whatever your stitching goals for 2017, we aim to cover all bases. Get into quilting with our beginner’s project on p68, give bag-making a go (p72) or start sewing toys with an easy owls (p84). Find details of our Dressmaker of the Competition on p34 and view some of the fabulous entries so far. There are four categories to enter if you haven’t yet, so whatever you enjoy stitching, it’s easy to share your creativity! For your FREE John Louden fat quarters bundle, worth £25, see p44! Sew Magazine, 1 Phoenix Court, Hawkins Road, Colchester, Essex, CO2 8JY.  hat you’re saying... W We take a look at what you’ve been making and sharing.  achine shopping M Sewing machine models you’ll love.  iveaways! G Enter for your chance to win prizes worth over £1,185!  arch preview M Next month we have TWO FREE patterns for you to enjoy. 94 Need to know All the practical advice you need. 97 R  eading room Add these stitchy titles to your bookshelf. 70 H  eart wall hanging Add a romantic touch to your home décor. 32 H  appy palentine’s day Discover how you can spoil your nearest and dearest. 36 P  leats, please! Part two of our heritage series looks at the art of pleating. 40 B  are necessities Be inspired to stitch you own lingerie.  addle bag S Accessorise in style with this zingy tote!  ea strainer embroidery T Upcycle unwanted kitchen items into an embroidered masterpiece.  y sewing room 98 M Meet stitchy guru and TV personality, Debbie Shore. 82 C  osy cowl top A soft sweatshirt is an ideal make this spring.  oot & toot owl pals 84 H Our adorable twosome is the perfect stitch for little ones.  tuart Hillard S The Sew columnist tells us why we shouldn’t be afraid of colour.  oveheart cushion L Make a quirky headrest for your one true love.  ome trends H Bring the outside, inside!  uilter’s corner Q Get the latest from our regular columnist, Corinne Bradd.  usie’s stitch school S Get some shut eye in style with our sleeping mask project.  lamingo quilt F Use squares and rectangles to create your very first quilt.  rickly situation P Our fave FREE cactus projects! FREE* John Louden fabric when you subscribe to Sew magazine today!  0% off New Look 6301 5 Grab your discount on this stylish wrap number.  0% off Simplicity 8228 5 and 8229 Stitching your own lingerie is easy with these great offers.  ubscribe today S Take out a subscription with this fantasic offer!  REE* sewing book F Make sure you claim your copy of Start to Sew.  0% off at Girl Charlee 5 Claim your 50% discount! pages of fashion, garments & more! FREE THIS MONTH... Your FREE Simplicity 1653 pattern has three fantastic Amazing Fit dresses you can get stitching right away! With a great range of cup sizes available, all figures are catered for!  tylish wrap dresses S Use your FREE pattern to create three figureflattering styles.  ersey top & skirt J Add this simple two-piece to your wardrobe today.  attern picks P May Martinâ&#x20AC;&#x2122;s top choices this month.  auren Guthrie L Our columnist on stitching your way through winter. Indie pattern news All the latest patterns from independent designers.  ressmaker of the D Year competition Just some of your entries so far!  eplum top P Sew a flattering top with hidden pleated detail.  implicity style S school Stitch the lingerie you want to wear today. Love that fabric... Make it monochrome this month.  o-pattern N Japanese skirt Create a statement garment today. Fashion forecast Start sewing with denim fabrics.  ace-trimmed L nightie Join our masterclass to stitch your own unique nightwear!  &A Q Our experts answer all of your stitching questions and queries. Workable wardrobe pieces and pretty spring dresses! Sew Wardrobe, a collection of dressmaking patterns by Alison Smith MBE, has a fantastic new range of kits to make many of her popular garment patterns – including her Bella dress, Mia Top, Paris midi skirt, Elsa trousers and Zara corset. As well as offering a choice of two or three fabrics to make your chosen item in, each kit contains everything else required – such as lining, interfacing and haberdashery, or corset supplies, plus the option to add the pattern if you haven't already bought it separately. Prices start from £22! Visit www.sewwardrobe.co.uk. Caroline Beacon, owner of fabric shop and craft school Stitched By You situated on Alton High Street in Hampshire, has announced that her business is up for sale. “This decision has been forced on me due to ill health but on a positive note, I will be looking for a buyer who shares my passion and wishes to continue to build Stitched By You,” she says. “The shop, spring retreat and classes will run as normal to the end of the summer timetable. I thank you for your continued support and will still be here, so do pop in and say Hi!” For details about the business, call Caroline's agent Keith Green of Anderson Moore on 01256 770907, email keith@andersonmoore.co.uk or visit www.andersonmoore.co.uk. Share your crafty makes and stories with us to be in with the chance of winning a fantastic prize! Star Letter “I completed this outfit for a friend’s wedding” My mum was an amazing dressmaker and gave me a sewing machine for Christmas, but she sadly passed away last year. After the machine gathered dust for a while, I decided it was time to teach myself how to sew. Once I stitched a few small projects, I completed this outfit for my friend’s wedding, including a jacket from issue 87’s pattern, a dress from the book Sew Many Dresses, Sew Little Time and a tie for my husband. I’m now a bit obsessed and look forward to my issue of Sew each month! After having my daughter in 2015, I was inspired by Lauren Guthrie’s column when she talked about making time to stitch after becoming a mum. So off I went, and here is a picture of my completed monkey from issue 86 of Sew, which I made to give to my daughter for her first birthday. I love Sew and all the projects, so hopefully this will be the first of many! Rachel Mellish It can sometimes be hard to find the time, Rachel, but we’re so pleased you’ve dusted off your sewing machine and found your love of stitching again! “I’ve been stitching to help save dogs’ lives!” Amongst other projects I have been making bone-shaped dog toys to sell for Operation Waggy Tails, which helps get dogs out of shelters in Spain. It’s a great charity, which has been able to rescue many dogs from a certain death. I made the bones using Michael Miller’s Pooh Pooh Polka Dot fabric. Katharine Creasy Your story is truly inspiring, Katharine. Your mum would be very proud of you for teaching yourself how to sew! What an amazing cause, Cheryl! It’s lovely to see that stitching can help save the lives of these animals. Keep up the great work! I stitched one of Jess Brown’s rag dolls from her pattern book. This is my latest make from issue 91, which I have loved sewing! I have to admit, I was very surprised by how quickly the dress was finished – it took less than a day to make and I’m really pleased with the end result! It’s quickly become one of my favourite patterns and I probably would have never attempted it before, so thank you Sew. Lesley Langlard Made these for a friend’s little girls from issue 79 of @SewHQ. Baby-friendly felt eyes on the blue one. Sharon James-Watkins We knew this would be a favourite, Sharon - your fabric choice is fabulous! Janice Judge	My reindeer toys from issue 91 of Sew. I had great fun making them! Laura Dickson	Halfway through making this 1960s dress for my wardrobe! “I loved making the reindeers from issue 91!” These are my lovely reindeer stuffed toys from issue 91! I intended to make two, but they were so easy to stitch, I decided to make a third. Each one took only a fat quarter of fabric. I am a fairly new subscriber to Sew and this was the first thing I have ever tried to make. I am now inspired to try something a little more challenging! Christina Burton These reindeers are adorable, Christina! We can’t wait to see what you get stitching next. What You’re Saying, Sew Magazine, 1 Phoenix Court, Hawkins Road, Colchester, Essex, CO2 8JY. The Amazing Fit range by Simplicity is a relief for those who struggle finding patterns to suit their frame and shape. More often than not, women are not a standard size and therefore welcome the option to alter patterns to fit properly â&#x20AC;&#x201C; that's why you'll love stitching this figure-flattering dress, which has a mock wrap front. Test your skills by using a stretch knit fabric, to give you added appeal in all of the right places! The key to any successful garment is the fit and how it suits your figure, which is why Simplicity's Amazing Fit range is such an exciting line of sewing patterns. Included within Simplicity 1653 are extra pattern pieces that have been designed to fit your body – whether you're curvy, average or slim fit. It also includes bust cup sizes from B to DD. A 1" seam allowance in prime areas allows you to finetune the fit as you sew. What’s your Simplicity size? Remember to use your body measurements to find your pattern size, NOT your ready-to-wear size that you’d buy in the high street shops. Visit www.simplicitynewlook.com to find out more about taking accurate measurements and getting the right fit for your shape. 20% of at Girl Charlee Knit fabrics generally have varying degrees of built-in stretch, which is often down to the spandex content. Online store Girl Charlee stock a great range of soft, high-quality versions that you can choose from in a host of fresh designs. Turn to p77 to claim your exclusive discount! l The personalised sizing works well. Once the adjustments are made the paper pattern can be adjusted permanently. Future garments will be guaranteed to fit perfectly every time. l Stretch fabrics require careful handling. Ensure you don't overstretch the fabric as you cut out as it will regain its original shape, altering the size of the garment. l Use a jersey or ballpoint needle when sewing to avoid laddering the material. Choose a stretch stitch on your machine to retain the stretch of the fabric. l Read the instructions carefully before starting, as the varied seam allowances marked on the pattern will be explained. Just for you! If you've fallen for our Amazing Fit wrap dress but require a different size bracket, we're offering New Look 6301 for the special price of £3.48 (RRP £6.95), plus 85p postage. Just quote SEW6301 at the checkout when you visit www.simplicitynewlook. com. Offer available from 12th January to 9th February. For everyday style, pair with classic ballet pumps. Shoes from Next. Next issue you can enjoy not one, but two amazing patterns completely FREE. With both New Look 6447 and New Look 6163 on offer, that's a total of eight garments you can get stitching today! Whatever your style, you can choose between pretty spring dresses or smart trousers and coats to keep the chills at bay. On sale 9th February! Palazzo pants have lots of ease, providing a comfortable, relaxed fit thatâ&#x20AC;&#x2122;s great for holidays and travelling. These trousers create a slimming shape for shorter figures. The fitted legs elongate and flatter, providing a longer silhouette. Most patterns feature international sizes which differ from ready-towear sizing. It is essential that you take your exact body measurements and compare with the sizing charts on each pattern. PAIR OF TROUSERS Cargo-style pants This is a great pattern to start your trouser making adventure with. They have a relaxed feel about them, with a simple drawstring waist and plenty of pockets to practise on! rousers come in many shapes and styles, and you can achieve a good fit by having the right amount of ease for the shape you wish to create. Jeggings or leggings have minimum ease as they fit closely and usually have some stretch fibre incorporated into the fabric. Jeans are more fitted and have at least 2.5cm ease at the waist so that you can bend over, while most trousers have 5cm-7cm ease. If in doubt, allow more ease initially. This is a rough guide but as the style becomes looser, the styling ease increases. Your fabric can affect the way trousers sit on the body. If you are short, avoid overly thick or shiny types as these will add bulk. Instead, choose fabrics that drape well. Wool crepe is divine to work with but can be pricey, so why not try a synthetic alternative within your price range? Take time altering a trouser pattern to fit well and change the look every time by making it up in different fabrics. Until next month, STOCKIST INFORMATION For Simplicity patterns, visit www.simplicity newlook.com, 0161 480 8734. For Named Clothing pattern stockists, visit www.namedclothing.com For McCall’s patterns, visit www.sewdirect.com, 0844 880 1263. For more dressmaking advice, be sure to pick up May Martin’s Sewing Bible: 40 Years of Tips and Tricks (£25, HarperCollins). BABY’S KIMONO TOP This cute kimono-style is perfect for any newborn baby (up to three months) and to make it extra-easy to put on, features a hidden snap closure and front-tie style. You can also find the instructions to make a pair of matching bloomers at www.sewmag.co.uk/patterns. Seek out a soft and breathable fabric like cotton, double-gauze or linen, and prep it by washing, drying and pressing first. For the top back, measure out a 20.3cm x 30.4cm rectangle. On the right vertical line, measure 11.4cm from the top. Draw a perpendicular 7.6cm line extending to the left. This is the underarm portion of the sleeve. For the back neckline, from the upper left corner measure 3.8cm to the right and make a mark. From the same corner, measure 1.9cm down and make a mark. Draw a 1.9cm x 3.8cm rectangle within the upper left corner. Create the back neckline by sketching a curve between the two marks, making sure the line at the base of the neck is initially perpendicular. Cut out and label ‘Kimono Top Back, cut one on fold.’ For the kimono top front, place the kimono top back onto pattern paper. This piece will be a bit bigger, so give yourself a few extra inches to the left of the top back. Trace the pattern piece, extending the bottom to the left by 7.6cm. Draw a 17.7cm perpendicular vertical line from the bottom of this line. From the neckline point to the top of the 17.7cm line, draw a smooth curve, forming a right angle where the curve meets at the top of the 17.7cm line (aka the front flap corner). To indicate where the ties and elastic will be attached, mark 1.9cm down from the armpit. Cut out the pattern piece and label ‘Kimono Top Front, cut two.’ Fold the fabric in half, selvedge to selvedge with the wrong side facing out, and trace the pattern pieces. If using a patterned fabric, fold it with the right side facing out. Arrange the pieces to fit, leaving some diagonal space if using the same fabric for the bias tape. Otherwise, make bias binding from contrasting fabric or use shop-bought. Referring to the cutting layout, trace the pattern pieces, making sure to mark the tie placement on the front and cut out. To make the bias tape, press the fabric in half towards the wrong side, then press the upper and lower edges toward the centre crease (also towards the wrong side). The binding should measure 3.8cm wide – cut it into two strips, one measuring 83.8cm and the other 41.9cm. If using shop-bought binding, cut it into three strips measuring 83.8cm, 33cm and 8.8cm. Sew the 41.9cm long tie. Open the bias binding, fold one end towards the wrong side by 6mm, fold back up and edge stitch the tie. When finished, measure 8.8cm from the raw edge and cut. Zigzag stitch one end of the shortest 8.8cm tie. tie hanging off the corner of the left flap. Turn the garment right side out and check the lengths of the ties by tying them into a bow, then trim any excess from the pinned tie to even it out with the shorter tie. Fold the hanging raw edge of the tie towards the wrong side by 6mm and press. Sew bias binding onto the top, 6mm from the edge, following the crease line formed when creating the bias tape. Trim the seam allowance to 3mm up to the corner of the left flap. Fold over the bias binding towards the right side of the top so the raw edges are neatly enclosed, remembering to press the short edge of the hanging tie to the wrong side to hide the raw edge. Edge stitch. To sew on the snaps, make sure the short tie reaches the corner of the right flap. Fold the zigzag edge of the short tie about 1.2cm, or the appropriate amount to just overlap with that corner and hand stitch. Add snaps by attaching the stud section on the bodice and the socket section on the tie. Monochrome madness Work opposite ends of the spectrum for stylish stitching If monochrome is good enough for Coco Chanel, we’re certainly not about to question its place in our dressmaking ventures. Pair classic black together with white hues for sophisticated chic appeal all round. Dimensions Custom sized Finished length: 60cm from top of the waistband 1cm seam allowance used throughout unless otherwise stated. Go online to www.sewmag.co.uk/templates to download and print the pocket template. Cut out all the required pieces, referring to the cutting guide above. Take one front skirt piece with the selvedge at the lower end, mark the centre front at the top edge with a pin, then place a pin at 3.5cm. Linen can be beautiful to work with – it’s not only easy to sew, but the fabric drapes well and is comfortable to wear. Made from two simple rectangles, this skirt by Fiona Hesford is both simple to make and a stylish addition to your wardrobe. There’s a cheeky pocket in one side seam and a tie belt detail on the other, so you’re sure to turn heads in this dynamic number. skirt and topstitch 4mm from the seam on the pocket side . Insert the zip into the right side. Pin the skirt together at the side seams. Try on for size and make adjustments if required. Sew a 1.5cm seam allowance and press the seam open . Fold the tie pieces in half lengthways with right sides together. Sew a 1cm seam along two long sides and one short side. Turn the tie inside out through the opening at one end and press. Pin the tie at the far side of the unfolded waistband with right sides facing and raw edges aligned. Tack in place. With right sides together, fold over the waistband and stitch 1cm at the short side. Trim the seam allowance and turn the waistband to the right side, pushing out the corners . Pin the folded edge of the waistband all around on the inside, aligning with the stitch line. Slipstitch all around. Remove all of the tacking stitches and press. Hem the lower edge to the desired length or if you prefer, leave the raw edges for a small fringe effect. When turning the ties right side out, leave a long thread end after sewing, approximately the same length as the tie, and secure with a knot to the eye of a rounded tip chunky hand sewing needle. Pass the needle through the tie and out the other end. Pull the threads tightly and ease the tie out. Many of us avoid working with denim and with a reputation of being tricky to sew, it’s no wonder. When armed with the right tools for the job however, stitching this fabric is much easier than you may think. If making jeans for example, there are respective needles for this, and if working a flat felled seam, heavier duty topstitching threads will help strengthen it. Thinking of giving denim a try? Pop along to your local sewing shop for some jeanius advice. Download and print the pattern and fabric layout guides at www.sewmag.co.uk/ templates. Fold 1.2m x 1.5m of jersey fabric with the selvedges at the centre and cut out a front and back with each template lined up to the fold. Fold the fabric widthways, matching the selvedges, and snip the sleeve piece on the folded fabric so you are cutting two at once. Cut a front and back facing with each template lined up to the fold. Coordinate your look with this fantastic matching set! This stripy top and skirt by Fiona Hesford are both simple to make and so comfortable to lounge about in. The crop top is made using just three pattern pieces and has a flattering lower curved hem and short raglan sleeves – you can also wear this with jeans or jeggings for an alternative look. The skirt is a pull-on figure hugging style that can be adapted to a shorter length, if preferred. Pin the sleeves to the front piece at the curved edges and sew a 1.5cm seam allowance. Repeat for the back piece. Finish the raw edges and press. Mark the front side with pieces of masking tape. Join the facing pieces together at the short sides, right sides together. Press the seam open then pin to the neck edge. Tack, then sew a 1cm seam all around. Remove the tacking. Turn the facing to the wrong side, press, tack in position, then topstitch 3cm from the edge on the right side on your machine. Join the front to the back at the side seam, right sides together . Fold over and press a 3cm hem at the sleeve edge. Pin, then sew close to the edge . Fold over and press a 3cm hem at the lower curved edge, pin and sew close to the edge. Take care not to stretch the fabric too much when sewing . Fold 1m x 1.5m of jersey fabric with the selvedges together at the centre. Cut two each of the front, back and waistband pieces with the templates lined up to the fold. Pin the skirt together at the sides, right sides together. Sew a 1.5cm seam, leaving an opening on one side as indicated on the template, then press . TIPS FOR SEWING JERSEY Jersey fabric requires a ballpoint or stretch needle. Adjusting the stitch length slightly to 2.6mm helps ease the flow through the machine. Take care not to stretch the fabric as you sew except where specified (i.e. at the waistband). If you don’t own an overlocker, you can leave the raw edges unfinished as they won’t fray – or use an overlocking stitch on your machine. ne of the things I look forward to most in the shop at the start of a new year is getting in lots of new fabric deliveries – it’s always so exciting! The new Atelier Brunette French terry cotton sweatshirt fabric and plain viscose crepe collection are due to arrive any day now, and I cannot wait to start sewing with them. The quality of these fabrics is always incredibly high and they really are a joy to sew with. I think the colours are beautiful as well – especially the metallic finish on the sweatshirt! Discovering new ranges and brands to bring into the shop is one of the things I enjoy most about having my own business. We have some gorgeous new cotton lawn prints coming in that are perfect for blouses and tops. I’m also eagerly awaiting a delivery of some beautiful lightweight cotton jacquard fabric, which is all designed and manufactured in Spain. The continuous supply of fabrics is an endless source of inspiration! Even though the days are short at the moment and it feels a little cold and dark - with Christmas been and gone - it’s nice to start looking forward to what the rest of the year has in store. The g&g team and I have been busy planning lots of special events and workshops, and have decided to change things on our workshop calendar this year. We are offering shorter one-day workshops that focus on techniques such as fitting, bust adjustments and shirtmaking techniques, to name just a few! If you are looking to transition into more dressmaking, we have added a simple shift dress workshop to run alongside our Simple Top and Simple Skirt workshops, which are great for beginners. 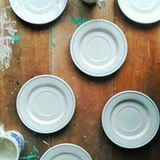 Dates for our classes can be found at www.guthrie-ghani.co.uk/workshops. This year, we are also attending more external events and craft fairs, especially in the Midlands area. I love getting out and meeting customers – and I’m looking forward to taking the g&g shop out on the road. Next up on my to-sew list is the Reina shirt by Pauline Alice Patterns, using a new viscose crepe from Atelier Brunette. I love the classic feminine style of this pattern and the fabric will drape really will with all the gathers at the yoke section. Working with lighter weight, slippery fabrics like this one always requires a bit more patience. You get better results if you take the time to use lots of pins or hand tack the seams in place – especially the sleeves! Usually, I just use regular dressmaking shears to cut out my fabric, but on finer fabrics I tend to use pattern weights, a rotary cutter and my self healing mat to get more accurate results. This year, I am trying to use up more of my fabric stash, so for every brand new project I make, my aim is to also make something from my stash. Now that I have baby Sophia to make clothes for – as well as myself I’m hoping this will be easier than it sounds! I’ve found that as she gets older I’m getting through even more clothes, as they get so messy at meal times. Nowadays I am frequently asked how I manage to fit in time for sewing with a baby - so find out some of my top tips below! Every so often, work on a smaller or quicker project that you can finish in a day! ✓ Perfect for beginners. ✓ Two length options. ✓ Easy downloadable pattern. Why sew loves... ✓ Sizes 8-20. ✓ In-seam pockets. ✓ Sleeve variations. This super sweet trapeze dress fits comfortably with its flattering, loosestyle. With an added ruffle, Peter Pan collar and optional cute bow, there are design elements for everyone to enjoy. Choose from three different sleeve styles: three-quarter length sleeves with cuffs, short sleeves or sleeveless. Whatever the occasion, the Marshmallow dress is a style that’s versatile enough to be dressed up or down with ease – so have fun creating! An outfit that leaves you instantly feeling amazing is something we all desire – right? The oversized shirt dress from The Maker’s Atelier is precisely that. Wear as a dress or pair with jeans or leggings as an over-shirt. It’s perfect for most shirting fabrics, from cool cottons and linens through to warmer materials such as babycord or brushed fabrics. Say hello to your new everyday favourite, which features a flared skirt and a feminine V-shaped neckline. With three sleeve options to choose from, you can decide between short, three-quarter or long versions. Whatever season you have in mind, this versatile pattern will be sure to see you through the whole year ahead. Why sew loves... ✓ Two variations. ✓ Long or short sleeves. ✓ Versatile style. ✓ Three cup sizes. ✓ Plus size pattern. ✓ Ideal beginner pattern. Why sew loves... ✓ Sizes 32A-42DD. ✓ All-in-one kit. ✓ Three colour options. Check out our lingerie feature on P40! SHOW YOUR BEST FRIENDS SOME LOVE WITH A STITCHY GIFT! alentine’s Day is generally a time for couples to celebrate their love – but have you heard of Palentine’s Day? This recently-created holiday falls on February 13th and encourages people to celebrate the other, equally important relationship with their best friends. Why not organise a fun get-together where you can present your BFFs with a gift to show just how much they mean to you? Here are just a few ideas to get you started. Want more ideas? Why not sew our stylish saddle bag on p72 for your best bud! Sign a keen stitcher up to the Owl and the Sewing Cat's new surprise sewing kit service. Each month, they will receive a mystery parcel containing a pattern, instructions, fabric and trims to make a lovely project. Prices start from £18.95 per month, with beginner and advanced kits available. Visit www.owland sewingcat.com or call 01323 325342. Discover how you can take the crown and become our champion stitcher! f you love stitching garments - whether you’re new to sewing or have enjoyed the craft for years - we welcome you to enter our Dressmaker of the Year competition. Along with our sister title Dressmaker, we’ve loved receiving your entries, and Crafty HQ is humming with the buzz of stitchy excitement as photos of your garments come flooding in! Whatever your abilities, we hope you take the chance to share your creations with the rest of the sewing community – there are four different categories to enter, so we’re sure there will be one to suit you. We’ve loved seeing every entry so far, and feel so proud that dressmaking is enjoyed by so many of you. Please, don’t be shy… take the leap and be sewcial with your stitching! If you’ve ever stitched for a little person, this category is for you. Whether it’s kiddie capes, pyjama sets, christening dresses or fancy dress – share your piccies today! STUART HILLARD Since appearing on The Great British Sewing Bee, Stuart has become a global stitching ambassador. THE FOLD LINE Kate Underdown and Rachel Walker co-run an inspirational online sewing community, The Fold Line. We’ll also be having a special reader selection category, where YOU will get to pick which garment has impressed you most! EDITORS OF SEW AND DRESSMAKER Completing our judging panel is Sew editor, Jennifer Ward, and editor of Make it Today Dressmaker, Sarah Crosland. Don't forget to use the hashtag #Dressmakeroftheyear on social media! Stitched a garment that wouldn’t be out of place in a high street shop? If it has ease of wear and quality factored into it, enter your creation today! There’s a whole host of prizes up for grabs, including a Brother Innov-is F420 sewing machine, an Adjustoform mannequin and lots more! Plus, you and your garment will be featured in print, online and on the Create and Craft TV channel. #3VINTAGE #4 CUSTOMISING Whatever era you’re swept up by, we’d love you to take us back there. You may have used an old pattern, a retro fabric – or it could just be vintage inspired! Transformed an unused garment into a wardrobe staple, or have you upcycled a shirt into something completely unexpected? This one’s for you. ccordion, box, sunray or flat â&#x20AC;&#x201C; whatever springs to mind when you think of pleating, there are many ways to work the style into your wardrobe. So, we decided to take a look back at its fashion roots and explore the process that helps create such statement garments, with just a piece of fabric. To catch a glimpse into the industry, we spoke to Matt Weinert, Managing Director of Ciment Pleating, the oldest pleating firm in the UK. which suggest that the Egyptians used these to aid in the pleating process. The Greeks were also known to pleat the linen they used to fashion their tunics. The fabric was fixed on the shoulders by two brooches and wrapped around the waist with a belt. This method of creating pleats took time as it was completed by hand â&#x20AC;&#x201C; the garment was washed before the pleats were varnished, which was repeated multiple times to achieve the perfect look. Another distinctive pleated look were the ruffs worn by both men and women towards the end of the 16th century, where they would adorn these spectacular pieces to frame their faces. Ruffs were created by pleating a fabric inside warm metallic cylinders, which were used each time the fabric was washed, as they would otherwise lose their shape and volume. which is made up of two pieces of card that are folded identically so that they can fit together. Most of the moulds used have a wrapper on the outside to protect the pattern while it is heated. In order to pleat fabric, the two pieces of card need to be separated with one laid flat on a table. The fabric is placed on top of the card before the remaining card is placed on top to secure it. Once the fabric is sandwiched between the two pieces of card, the pattern needs to be folded into shape and rolled up tightly. It is then placed in a steam cabinet to heat set the fabric into the required shape. After the pattern has been left to cool, the fabric can be removed and will now maintain the shape of the pattern used to pleat it. Polyester fabrics work particularly well for pleating as they are made from plastic, which means that when they come in contact with a heat source, they become permanently altered. That's why most ready-to-wear pleated garments you'll see are made from polyester. They can easily be washed and don't require any ironing â&#x20AC;&#x201C; bonus! Head over to our blog www.sewmag. co.uk/blog to see how Ciment Pleating created our sunray pleat for the peplum top overleaf! Opening its doors back in 1925, Ciment Pleating is the oldest pleating firm in the UK. It has developed a reputation with customers as the number one for pleating in the country, regularly exporting its services to Europe and the rest of the world. As a family-run business, spanning three generations of the Weinert name, they pride themselves on the utmost quality. The company supplies specially pleated fabrics for fashion and interior designers, home dressmakers, fashion colleges, film companies and advertising firms – as well as theatrical costumiers and milliners. “There's not a massive market for pleating here in the UK, so we mainly work with high-end clientele,” Matt Weinert tells Sew. Dimensions Custom sized 1.5cm seam allowance used throughout except the lower edge of the peplum, where a 1cm seam allowance is used. Sew a stylish top with a pretty pleated detail A figure flattering choice for all, this peplum top by Amanda Walker is sure to get heads turning. Featuring a secret pleated detail within the design – which we sent off to the talented folk at Ciment Pleating, this stylish number is the perfect choice for all. Pair with lightweight trousers or a fitted pencil skirt to take this top from day to night with ease. Go online to www.sewmag.co.uk/ templates to download and print the templates, then cut out referring to the cutting guide. Fuse the interfacing to the wrong side of the front and back facings. Position and pin the back facings to the front with right sides together. Sew the seam and neaten the outer edge. Stitch the darts on the front bodice piece, from the base to the points marked on the pattern. Repeat for the back bodice pieces. Press the darts towards the centre front and back. Neaten the edges of the front darts, side seams and shoulder seams. Position the front and back bodice pieces right sides together, match the edges and pin in position. Stitch the shoulder seams together and press the seam allowances open. Lay the bodice out flat, with right sides facing upwards, lay the joined facing on top with the right side facing down, matching the necklines together and pin. Stitch around the neckline, clipping the seam allowances around the curve. Under-stitch the neckline, stopping roughly 4cm from each centre back edge. Match the side seams together and pin. Stitch from the base of the bodice up to the underarms. Press the seam open. Adjust the stitch length on your machine to size 5, then stitch a row of gathering stitches around the head of the sleeve, starting from the front notch and finishing at the back notches. Match, pin and stitch the underarm sleeve together with right sides facing. Turn the sleeves to the right side. sleeves together, pin and stitch in place. Neaten the seam allowances of the armhole and the base of the sleeves. Fold and press the 3cm sleeve hems, then hand hem in place. pleated section needs to be completed and the other after turning one section to the right side. The edges of the pleated section will be sandwiched between the peplum and the lining. Turn the lining inside out, carefully tease out the seams and press flat. Divide the peplum pieces into two sets – one set will become the lining. Join the centre back seams as far as the zip notch, then clip the seam allowance at these points. Lay the front peplum pieces over the back pieces with right sides of the fabric facing. Pin the side seams together on both sets and stitch in place. Press all the seams open. Neaten the edges of the centre back opening. Stitch the concealed zip into the back opening using a zipper foot. Fold and press the seam allowance along the two sides of the back opening. Open out the seam allowance, and with the right side of the fabric facing, place the opened zip face down, matching the teeth to the crease line in the seam allowance. Pin in place. Position and pin the peplum to the bodice, matching the side seams and centre fronts together – the pleat section should run in line with the left front dart, (you may need to clip the waistline curve of the peplum to match the seams). Stitch in place, then neaten the seam allowance. To finish, slip stitch the facing in place. Fold in the seam allowance along the edge of the zip, stitch and secure the facing to the ends of the shoulder seams. Simplicity 8228 offers two feminine soft-cup bralette choices, in a plunge halter or racerback with a sweetheart neckline, plus high-waisted underwear with scalloped lace trimmings. Bra sizes range from 32A to 42DD, and the underwear can be made up in sizes XS-XL. The channelling at the cup seam gives you a little more support, and with no underwiring this pattern is a great introduction for first-time bra makers. It’s designed for 30%-40% stretch lace, while you can try your hand at sewing the knickers in spandex for the perfect shaping underwear. Chances are, the bra you’re wearing right now doesn’t fit – but you don’t have to put up with it. Shopping for a new one can be more painful than a rogue underwire, so forgo the hassle (not to mention expense) and make your own. Stitching delicates may seem daunting, but there are plenty of quick and easy patterns, and your chest is sure to thank you. Since we get that each woman’s preference is different, we’ve got not one, but two discounted patterns (try both if you’d like). Get a move on, your new breast friend is waiting for you! Double discount for the new year! Get Simplicity 8228 and 8229 by Madalynne Flanigan for the special price of £3.48 each plus 85p P&P (RRP £6.95) from www.simplicitynewlook. com and quote code SEW8228 or SEW8229. Offer valid 12th January to 9th February. Rock the retro-chic look with Simplicity 1426, available in sizes 4-22. It’s difficult to choose between the faux-wrap halter style, ruched cross-back, retro balconette, button-back strapless bra and bandeau – why not make them all? They’re made to be seen, so wear one under a sheer top, or alone with a pair of high-waisted shorts to make a holiday statement. Keep it vintage with a sweet gingham, or more confident sewists can stitch one up in a fabric with a little elastane (remember to adjust for stretch when cutting) for a stylish bikini top. If you’re looking for a beautiful, supportive bra with underwiring, look no further than the Simplicity 8229. It’s available in sizes 32A to 42DD, and has a full-band design for extra stability. It also has a hook-and-eye closure at the back, adjustable straps and the scalloped lace edging on the upper cups – adding a pretty touch. It also includes the pattern to make a simple pair of underwear with a flattering high-waisted silhouette in sizes XS-XL. A gift subscription is the perfect present that lasts all year round! This month we have two sets of fat quarter packs (colours picked at random) totalling five metres of fabric. Both sets complement each other and can be used in a variety of ways, so you’ll have enough fabric to sew projects to your heart’s content. *Terms and conditions apply, see online for further details. Colour and design may vary. Cutting guide Upper front, lower front, upper back and lower back: cut one piece on the fold Mark gathering position as indicated on bust line for upper and flower front 1cm seam allowance used throughout unless otherwise specified. Print the pattern at www.sewmag.co.uk/ templates. Cut the pieces. Gather the upper front piece at the bustline between the notches. Take your length of stretch lace trim and press the piece into a curve to match the front seam. Pin the lace trim to the right side of the neck and armhole edge, tack and sew in place. Fold the lace to the reverse side. Press. It’s just one of life’s truths that you can never have too much nightwear – and why settle for anything less than gorgeous? This sophisticated nightie is designed by Fiona Hesford, owner of crafty company Sew Girl, and features a sweet empire line that is both flattering and comfortable to wear. Add a feminine flourish with lace detail and stitch your own unique version to lounge in today! Pin to the lower front piece, ease gathers up to match notches, and tack. Sew a 1cm seam. Clip the curved seam allowance. With right sides together, sew the upper and lower back pieces together. Press the seams upwards. Take the lace trimming and sew it below the seamline on the front and back of the nightie. Sew the front and back of the nightie together at the shoulder seam. Press the seams open. Attach lace to right of lower edge, fold to back; topstitch. Gather shoulder seams with shirring elastic. Sew with a long stitch length. MASTER JERSEY When cutting out your pieces, fold the fabric in half right sides together, with the selvedges aligned at the centre. Lay your fabric on a sheet or blanket to stop it moving when cutting out. You can leave edges raw or finish with an overlocker if the fabric requires it. Whatever your sewing problem, our experts have the answer! was making a tote bag, but the bottom layer of fabric stretched out when I tried to sew the straps on. How do I stop this happening? Unfortunately, there are always going to be machine difficulties when you are sewing multiple layers of fabric together. This is especially true for something like a tote bag, because it’s generally made from a heavier weight fabric so that it can hold all your shopping without tearing or falling apart! However, there are a couple of things that you can do next time to help prevent the fabric stretching out. One option is to tack down the straps before you sew them properly. You can do this by hand, or on your machine by changing the stitch length so it is longer. This should help hold the strapping in place and reduce the stretching. Lisa says Lining a dress is typically very simple. When I’m short on time I tend to stick with facings, but there’s something about a full lining that makes me feel super special. I just make a copy of the dress in my lining fabric, and attach it at the neckline. Once the zip is sewn in, I like to hand stitch the lining in place at the centre back and waist seam to anchor it to the inside of the dress. There’s nothing worse than an unruly lining! My favourite method of lining a dress with a centre back seam is to sew up the bodice twice, one in the outer fabric and one in the lining fabric, attaching the front and back pieces at the shoulders only. Leave the side seams and centre back open, then with right sides together, stitch the front and back pieces at the neckline and around the armholes. Trim the seam allowances, clip the curves and under stitch as much as you can to anchor the lining to the inside. Pull the back pieces through the shoulders so that the bodice is the right way out. Then open the bodice fully out, and with right sides together, match the outer fabric to the outer fabric and the lining to the lining at the side seams. Stitch this long seam all in one go, and voila! You have a lined bodice, ready to attach to your skirt. Insert the zip as normal, before hand stitching the lining to the zip tape. The 570 QE is the first machine in the Bernina range to offer the BSR stitch regulator, guaranteeing even stitches as you guide the fabric. Whether altering the stitch length, needle position, or creating custom combinations, it will remember the stitch details for you. The free hand system is ideal for quilters, using a knee-lifter to raise the presser foot and lower the feed. Accessories include a walking foot for handling bulky or difficult fabrics, a ¼” patchwork foot and a large extension table. This spacious and feature-packed sewing and quilting machine offers a generous 210mm (8.3”) work space to the right of the needle, allowing you to sew bigger projects. The square feed drive system provides optimum stitch quality, plus you can choose from 140 built-in stitches (excluding lettering), five uppercase lettering styles and 10 automatic one-step buttonholes. The NV 1100 can also combine and memorise stitches, and offers a drop feed, knee lift, slide speed control, and an automatic needle threader and thread cutter. This computerised machine is extra-efficient with plenty of built-in assistance. For example, the unique exclusive sensor system automatically and continuously senses and adjusts as you sew any thickness of fabric, for perfect even feeding. The electronic self-adjusting thread tension sets the best one automatically for all sewing techniques and fabrics. A generous 200mm (8”) sewing surface and long arm makes it easy to work on large projects, while the advisor feature optimises your sewing with automatic settings. The Memory Craft 9400 QCP is the biggest long-arm model Janome has ever produced, boasting an impressive arm space of 280mm (11”), which makes it ideal not just for larger quilts, but also bridal dresses and bigger craft and home furnishing projects. As well as being big and powerful, stitch quality is also a priority with a built-in AcuFeed system for precise fabric handling, and an easy change needle plate. The machine also offers a speed of up to 1,060 stitches per minute, 91 needle positions, a 9mm stitch width, plus a stitch composer that allows you to design your own stitches, allowing your creativity to reach further heights! Other great features include an electronic knee lifter, an auto thread cutter and remote thread cutter port, plus an auto needle threader, easy set bobbin and bobbin winder, saving you even more valuable sewing time. See more of Lucy’s work on Facebook at Lucy’s Little Creations. an excellent and wide-ranging sewing and crafting knowledge – or you can shop via the revamped website for sewing machines and accessories, patterns, haberdashery and more. FIND OUT MORE… Visit Sewing & Craft Superstore, 292-312 Balham High Road, London, SW17 7AA. Alternatively, log on to www.craftysewer.com or call 0208 767 0036.
give a great deal of talks and workshops throughout the year, and receive many emails and questions on Create and Craft TV – but the number one question? It’s always on the subject of colour. Whether that’s choosing them, combining several together, or generally making colour work! So many creative people struggle with colour choices and I’ve certainly had my own struggles over the last thirty years as a crafter. The funny thing is that none of us are born with this fear of colour! During the years that I spent as a primary school teacher, I noticed that the younger the child, the greater their ability to experiment. We don’t start out fearing colour; we are instinctive, emotional and spontaneous, using whatever is in the palette. And if we don’t find what we are looking for, we mix them up. “Try to hold onto your innate sense of colour and don’t be swayed by convention” Unfortunately, it isn’t long before we become afraid. We learn that colours have a value and discover that certain ones are classy, some are garish, others are quiet, and a few shout and scream! As a nation, we don’t scream, we don’t shout… perish the thought of drawing attention to ourselves. We learn to be afraid and unlearning is hard – really hard! If you feel constrained by ‘the rules’ as such, cast them out and try something new. Look to Far Eastern or South American designs for examples of textiles that are way beyond your expectations of what should work. Use the colours of the moment but be bold and adventurous in how you use them. Harmonise, clash, blend and experiment. Be quiet, be loud and be bold, but above all, be beautiful! February is the time of year where I dust myself down, throw open the windows and get truly excited about decorating, seeking out fabulous colours for spring and summer. All the key trend predictors reveal their colour picks, while the world of fashion and interiors show off new collections. Pantone, the global name in colour trends, has predicted a gorgeous palette for this year – and I’m loving it! This season’s key colours connect with our inherent need to be at one with nature; the palette is earthy but fresh, bringing a sense of calm, confidence and energy. Soft but warm pastels abound with delicious colours like ‘Island Paradise’, a dazzling azure blue, ‘Greenery’ and ‘Pale Dogwood’, through to brighter shades like ‘Pink Yarrow’ and ‘Flame’. My favourite though is ‘Hazelnut’, a gorgeous neutral that blends warm grey and lilac pink in a shade so flattering, calm and cocooning, it makes me want to paint the world – and knowing Pantone’s ability to spot the best colours, I probably will! The Sew Easy Colour and Tone Guide is a must-have for any creative person, helping you to choose colours, find coordinates and accent colours with ease – all for just £6! It’s available in all good fabric shops or on eBay. Stitch a quirky headrest with a pocket today Valentine’s Day gifts that are romantic, good looking and practical can be hard to come by, so take notice of what we have for you here. Chloe Hailwood’s statement softie features on-trend pom-pom trimming as well as a handy pouch, which you can easily stash a good book in. It’s so simple to make up, with stunning results. Now is the time to use some of those fat quarters you’ve been saving! Visit www.sewmag.co.uk/templates to download and print the templates. Press interfacing onto the reverse of all fabrics, then cut as indicated in the cutting guide. Line up two red cotton strips at the short sides, right sides facing, then stitch across the width. Repeat with the other strips to create one long piece, then press the seams open. Pin the two medium hearts right sides together, then sew around, leaving a 4cm gap. Snip the seam allowance (see Sew Advice panel) before turning out. Press seams flat. Press adhesive webbing onto the reverse of the polka dot heart. Peel away the backing paper, then adhere to the centre of the pink heart. Cut 14 pom-poms from trimming and sew each one around the edge of the polka dot centre, spacing them evenly. Lay one printed cotton heart flat, with the right side facing up. Pin the trim to the seam allowance, so the pom-poms face the centre. Tack in place, then remove the pins. Position one long edge of the red fabric strip on top of the trim, tack in place and clip the material, removing the excess. Machine stitch around, leaving a 1cm seam allowance, then remove the tacking stitches. Snip the seam allowance, taking care at the groove at the top of the heart. Fill the pink panel with a thin, even layer of stuffing then sew the gap closed. Whip stitch in the centre of the patterned piece with a trim, leaving the top third open to use as a pocket. Pin the second patterned heart onto the remaining long edge of the red fabric, and tack. SEAMS ABOUT RIGHT Snipping at intervals along a seam allowance is vital for a smooth curved edge. Clipping concave curves allows the material to stretch further, while removing V-shaped notches from convex curves prevents material bulking. Cut diagonally beside corners to remove excess fabric. Snip closely, but ensure you don’t cut through your stitching. This hot pink fabric is perfect for the heart pouch! £2.30 per fat quarter. This vibrant print has a fabulous, folky feel. £3.65 per fat quarter. Create a beautiful clash with a bold red. £2.30 per fat quarter. If you or your family are lovers of the great outdoors, you don’t have to rummage through foliage or bring logs into your home to prove that you do! Those who prefer a minimalist approach can still keep their furnishings simple, whilst opting for wildlife and outdoors motifs along with pops of colour. This contemporary take on outside living includes a coated bird fabric hanging and cushions in bold graphic prints – which even acknowledge the beauty of buildings amongst the leaves and trees. Your one stop shop for everything! ’ve now got to the stage where along with the pair of cotton sheets I physically cannot find any more and vintage suitcase. storage for my fabric – or indeed To put it bluntly, I have turned into space for all the things I’ve sewn my grandmother – a woman who once and can’t bear to part with. My home is discovered 23 tins of peaches in syrup what people would politely call ‘cosy’, though tucked away in her kitchen cupboards, I suspect they’re secretly thinking ‘How can and kept new nightdresses ‘for best’. She you live like this? !’ I have haberdashery in every brought my mum up during the war, so all available container and subsequently it takes her frugal tips have been passed down me three hours to find the right length zip the generations to the extent that my or colour of ric rac. daughter, after recently seeing a news report My daughter’s about increasing friend walked into the inflation, remarked, house the other day, “We’ll just have to took one look at her tighten our belts, bedroom and squawked won’t we?” in surprise. Amy’s reply? Rescue therapy “I come from a long isn’t so bad. There’s line of hoarders. What a great deal of do you expect?” satisfaction to be It would appear I’ve gained when you taught her well. find something I’m lucky in as much that you know as I never feel the need you’ll need a couple for retail therapy, of years down the because if I were to line and an even buy new things on a greater sense of regular basis, there achievement when would be even less three years later, room to swing my cat. you can finally find Unfortunately, it amongst all the I indulge in rescue other stuff. ‘Making Whip up Corinne’s stylish leopard therapy instead, so good use of the print clutch bag featured in issue 20 whenever I see a bag things that we find’ of our sister magazine Make It Today of embroidery thread has become my Dressmaker, on sale 23rd December. mantra – thank you, in the charity shop for Visit www.makeittoday.co.uk just £3, I have to buy it... Uncle Bulgaria! Craft4Crafters Show This popular show returns to the Westpoint Arena in Exeter, from 16th-18th February, for three days of crafting delights. It includes textile displays, demonstrations, lectures, workshops and more then 170 national and local businesses selling sewing and other hobby supplies. To book your tickets, visit www.craft4crafters.co.uk or call 0345 304 0222. Visit our website below to view our full range of magazines to curl up with this winter! 8aceville.com/JAN17 (01795 414964 *Terms and Conditions apply, see online for full details. This is a limited offer. Saving is based upon first 3 issues. Download and print the templates at www. sewmag.co.uk/templates. Choose two pale and two darker fabrics for each dragonfly. Cut a body piece and a 3.5cm square from the darkest colour, then trim the square in half diagonally to make a triangle. Snip an 8.5cm square of lighter background fabric. Fold under 5mm on the long edge of the small triangle and finger press. Place the triangle on the corner of the background square and flip over on the folded edge so it sits face down on the square. Pin and stitch in place along the crease line to form the dragonfly’s head. wing A with a wing B from background fabric and stitch right sides together on the dashed line to make a half square triangle (HST). Repeat with the other pieces to make pairs of top and bottom wings . aligning the centre of the head with the middle of the body. Open out and press before squaring up the sides to make a 16cm block. Make three dragonfly blocks from different fabrics. Sew together in a row and lightly stiffen with thin fusible interfacing. Place face down onto a 16cm x 46cm rectangle of white cotton and sew around the edges, leaving a 10cm gap in the centre of the bottom edge. Clip the corners, turn out and press. Topstitch the top edge of the panel, fold in the raw edges of the gap and pin. Cut 30 11cm squares of different fabrics and sew together in two panels of 3 x 5. Press and pin onto felt wadding and white cotton. Topstitch along the seam lines before topstitching diagonally from corner to corner of each square. Trim the backing fabric and wadding to the edges of the patchwork. Cut several 2.5cm wide fabric strips to make straight binding. Bring the patchwork panel up to the back and front of your sewing machine and mark where the carrying handle is along the top edge of both pieces. Bind the edge between these marks with 2.5cm fabric strips. Place the patchwork pieces wrong sides facing and stitch together on the top unbound edges. Trim the seam allowance. Cut binding strips 1cm longer than these seams, fold under 5mm on the long edges plus one short edge of each and press. Pin the strips over the raw seams and topstitch in place. Bind the outer edges of the cover with 2.5cm strips joined end to end as necessary. Coming next month STITCH OUR ROMANTIC HEART BLOCK IN THE NEXT ISSUE OF SEW! Lay the cover flat and pin the dragonfly pocket panel to the bottom centre of one side. Pin and topstitch the pocket to the cover around three edges, closing the pinned gap as you do so. Topstitch down the seam lines between each block to divide the pocket into three. A turquoise background with wreaths of flowers. Delicate white blooms on light pink. He Loves Me Blue Daisy petals fall against navy blue. Here is a lovely embroidery technique that uses ribbon instead of thread! You can buy narrow ribbon especially manufactured for stitching to add a lovely texture and sheen to an embroidered piece. If you are new to ribbon embroidery, the floral motif decorating this sleep mask uses four stitches that are easy to master – the woven rose, plus chain stitch for the leaves and French knots and couching for the stems. Thread your needle with embroidery thread the same colour as the ribbon you are using. Begin by making a fly stitch – bring the needle up at A, down at B and up again at C, making sure the point is above the thread. Take it back down through the fabric just below, to create the Y-shaped stitch. Now add two straight stitches radiating out from the centre. You have now created five ‘spokes’, which form the foundation for weaving the rose. Thread your needle with a length of embroidery ribbon. Knot the end, then bring the needle up through the fabric close to the centre, where the five spokes meet. Take the needle under the nearest spoke then, working in an anticlockwise direction, take it over the next spoke, under the next and so on. Download and print the template at www.sewmag. co.uk/templates. Fold a 25cm square of pink linen fabric in half. Place the template on one half and draw around it, then repeat for the other half. On one of the mask shapes, transfer the design for the rose motif and lettering with an erasable marker. each one in place with green embroidery thread. Embroider a ribbon rose inside each circle, using different colours and widths of ribbon. Thread the needle with 2mm green ribbon and embroider a few leaves in chain stitch. The position of each leaf is shown on the template as a short line. Thread the needle with 2mm yellow ribbon and embroider a French knot in the positions indicated by a dot. Re-position the fabric in the hoop if necessary, and embroider the lettering in satin stitch, using three strands of embroidery thread. Remove the fabric from the hoop, place face down on a folded towel and press lightly with a steam iron to remove any creases. Cut out the two mask shapes plus a third one from felt, and sandwich it between the two linen pieces with the embroidered one on top. Stitch the pieces together through all thicknesses, close to the edge. Turn the work over. Cut 60cm of tape or ribbon in half and stitch one to each side edge. Bind the edges of the mask with bias binding, covering the cut ends of the tape at each side as you do so. Keep working in an anti-clockwise direction, taking the needle over and under each thread in turn, until you have reached the ends of the foundation stitches, by which time you will have created a rose. Take the needle down through the fabric and fasten off at the back. Our simple starter quilt by Corinne Bradd is the perfect way to begin your quilting journey. Made up of squares and rectangles, this beautifully bold design will capture the hearts of many. If you’d prefer to use plain fabrics to make yours, choose colours that complement each other and create your very own masterpiece! From three lighter flamingo printed cottons, cut 16 11cm squares from each fabric using a rotary cutter, quilter’s rule and cutting mat. Using two plain fabrics, cut 55 6cm x 11cm pieces of each colour. Cut 63 6cm squares of the darkest cotton fabric. Take an 11cm square and place a pink rectangle along the top edge with right sides together. Sew together using a 5mm seam allowance. Open out and finger press. Place a 6cm square on one end of a blue rectangle with right sides together, and sew down the short edge. Open out and finger press. Place the blue strip on the left side of an 11cm square with right sides facing, matching up the seams of the previous step. Sew together, then open out to make a 15cm block. Make up the remaining 11cm squares in this way. Arrange the blocks in a 6 x 9 grid, alternating the patterns as you do so. Make a note of the block that lies on the right-hand side and bottom edge. Stitch corresponding plain rectangles and 6cm squares to the right and bottom edges to form a continuous border around the layout. Begin joining the blocks in pairs, then sets of four, eight and so on to sew the quilt top together. Take care to match up existing seams for a neat, geometric finish. Press the quilt top with a hot steam iron to flatten all seams. Press the remaining piece of dark cotton and lay face down on a flat surface. Lay the wadding centrally over the top and finally the quilt top face up. Adjust the layers to ensure there is at least 4cm excess of backing fabric on each side. Pin the layers together at regular intervals and trim the wadding to the same size as the quilt top. Topstitch the layers together with pink thread, sewing along the seam lines, starting at the centre and working out to the edges each time to prevent the layers bunching up. Trim the excess backing fabric to leave a 3cm border. Fold over 1cm on the raw edges of the backing fabric, before folding over the edges of the quilt and pinning. Mitre the corners as you go, along. Topstitch the hem close to the interior edge. Bold and beautiful tropical design. Simple feathered friends against white. Classic flamingos on a lime backdrop. Use the same basic technique but on a smaller scale to create a fun cushion cover front. Add a romantic touch to your home decor We’re getting in the mood for lurve here at Sew HQ, as our love affair with fabric grows stronger by the day. This delightful project by Becky Clarke will help you use up scraps in your stash and is ideal for a speedy sewing fix! It makes a lovely nursery gift for expecting parents, or could even be made into a nostalgic keepsake – using fabric from treasured garments that baby has outgrown. Download and print the heart template at www.sewmag.co.uk/templates and use it to cut out 30 pieces (to make 15 hearts) with pinking shears, from a mixture of plain and patterned fabrics. Pin a pair of hearts wrong sides together. Hand sew a running stitch around the outside of the heart, 5mm from the edge, leaving a 3cm-4cm gap. Gently stuff each heart then sew the opening closed. Repeat to make 15 hearts. Thread white cord onto a tapestry needle, push the needle in between the stitching at the bottom point of the heart, then bring the needle out at the centre of the heart at the top. Repeat with four more stuffed hearts, spacing them out 9cm apart. Sew a few hand stitches to secure the cord and stop the hearts moving. Drill a hole in the centre of a bamboo cane, then 12cm either side. Thread the centre cord through and knot to secure, with 18cm cord below the bamboo. Trim the excess. Tie knots in the remaining cords, 9cm above the top heart. Thread through the bamboo and knot again before tying the two loose ends together to make a hanger. Trim the excess cord. the haberdashery Bird and butterfly garden Achieve a romantic look with a pink printed cotton. ÂŁ8.99 per metre. Plain cotton classics Use plain cotton chambrays alongside patterned prints. ÂŁ8 per metre. Bird and butterfly garden Pair grey and pink with fresh white for a vintage feel. ÂŁ8.99 per metre. Accessorise your spring wardrobe with this zingy bag Ellen Kharade’s chevron print saddle bag will make a great fashion statement this season, in bold shades of grey, black, white and lemon. The jumbo ric rac mirrors the fun zigzag pattern while the vintage button conceals the magnetic clasp beneath, keeping your belongings safe and sound. Download and print the templates at www.sewmag.co.uk/templates. Iron interfacing onto the reverse of grey/yellow chevron, grey/white chevron and yellow stripe fabrics. Cut out one flap, four side pieces and two linings from yellow stripe fabric, one flap and one back from grey/ yellow chevron fabric, and one front from grey/white chevron fabric. Pin wadding to the wrong sides of the bag flap, front, back and sides, then cut the shapes out. Tack all around to hold the pieces together. Machine stitch the bag flap, front and back, following the chevron pattern as you go. Machine stitch across the sides, using the horizontal lines as a guide. Remove the tacking stitches. Lay the yellow striped flap on top of the grey chevron front, wrong sides together, and mark the position of the clasp, using the pattern as a guide. Place the washer in position where the clasp is to be fitted and mark with a pencil. Carefully make a slit in the pencil marks with a scalpel, piercing through both pieces of fabric. From the right side, push the clasp through the slits in the front piece and fold the prongs down to the outside. Attach the other part of the clasp to the flap in the same way. Pin 60cm of ric rac to the inside curve of the grey-yellow chevron quilted flap and tack into place. With right sides facing, pin the quilted flap and the yellow striped flap pieces together, then machine stitch around the curve only. Turn the piece right side out and press. Topstitch around the curve, keeping the stitches neat and even. Sew the darts into the side sections as indicated on the pattern and press to one side. With right sides facing, pin the lining pieces together and machine stitch, leaving a 14cm gap at the base for turning. Trim the seams to reduce bulk and press with an iron. layers together, keeping the raw edges even. Turn the lining and the bag inside out and insert the bag into the lining, making sure that the flap sits inside the bag. Pin all the layers together then machine stitch into place. Remove the tacking stitches, turn the bag through the opening in the lining, then push the lining into the bag and re-shape. Sew up the gap with neat slipstitches and press under a warm iron. Topstitch around the top of the bag, keeping the stitches neat and even. together. Pin and machine stitch into place. Topstitch along the pressed edge. Trim a 7.5cm length from the strip and thread through a bag ring, tacking the folded edge behind it. Pin the loop to the side of the bag, coming down 6cm from the top of the bag edge, and machine stitch into place. Work the other side of the bag loop in the same way. Thread the remaining length of fabric through the bag loop, folding over the raw edge, and machine stitch into place. Work the other end of the bag handle in the same way. Hand sew a button onto the front of the bag, so that it corresponds with the bag clasp. Go online to www.sewmag. co.uk/templates to download and print the chart provided. Measure the mesh you will be working on by placing a tape measure across a section of the strainer and count how many holes there are to 2.5cm. The size of the mesh will determine how many strands of thread to use in your needle. For a mesh around 10-12 holes, use three strands; for 14-16 holes use two strands. For anyone who thought that a perfect cross-stitch design could only be achieved on fabric, say hello to our amazing upcyle! Rummage through your kitchen drawers or make a visit to a local charity shop to find a suitable strainer, then gather a few skeins of embroidery thread and you’ll have all you need to create Susie Johns’ pretty rose design. Hang on your walls for a simple update with added vintage charm. Thread your needle with the palest of the three flower shades. Referring to the chart and starting at the centre of the motif, make one cross stitch for each of the coloured squares. You may find it easier to keep changing colours, filling in the centre of the motif and working towards the edges of the flower. Embroider the leaves using two shades of green. It can be quite difficult to weave the needle through the backs of the stitches on the curved surface of the strainer, so it may be easier to leave a loose end and tie these ends together in a firm knot before trimming off any excess. To finish, tie a loop of ribbon to the handle to hang on the wall. GIRL CHARLEE FABRICS! Girl Charlee specialise in unique cotton jersey, cotton Lycra, Ponte de Roma, cotton rib knits, French terry, Hacci and other speciality knit fabrics. BOLT by Girl Charlee is a range of exclusive, high quality, super-soft pre-shrunk cotton spandex knits. Perfect for dresses, tees, tops, leggings, shorts and more, these soft to the touch fabrics are stylish, simple to sew and comfy to wear. Visit www.girlcharlee.co.uk and enter discount code SEWMAG20 to receive 20% off your order! *Terms and conditions: Discount code is valid until 26/3/2017. Not to be used in conjunction with any other offer. Here at Sew, we have arranged for a FREE* Start to Sew book for each of you! A beginner’s guide to all the essential knowhow that’ll have you stitching confidently in no time at all. Inside, delve into 72 easy makes, including adorable gifts for little ones and project ideas you’ll love! Place your order today at www.sewmag.co.uk/offerfeb and enter discount *Valid until May 16th code SEWFEB in your shopping basket! *Terms & Conditions: Orders must be placed by the 24th February 2017. Subject to availability while stocks last. Not to be used in conjunction with any other offer. We can only replace damaged or faulty goods. Please allow 28 days for delivery. An online collection of quality fabrics for dressmaking and crafts. New fabrics added weekly. For 15% OFF fabrics add SEW15 at checkout. On-line stockists of Liberty fabrics - Including Liberty Tana Lawn, needlecord, jersey and Lantana. The greatest selection of true vintage sewing patterns, from 1920s flapper dresses, to 1970s jumpsuits. A young, growing and much respected fabric, haberdashery and craft workshop business situated on Alton High Street is FOR SALE, sadly due to ill health. To enter our giveaways, just tick the box that corresponds with the prizes you want to win and send your entry to us no later than 23.02.2017. Mark your envelope: Sew February Giveaways, PO Box 443, Ipswich, Suffolk, IP2 8WG. giveaways! Enter now for your chance to win these amazing prizes! Scissor savvy A good pair of scissors is an item that every stitcher should own, which is why we’re very excited about offering five lucky readers the chance to win a pair of Amplify scissors from Fiskars. Enjoy precision cutting with ease and create wonderful garments in no time. To enter, tick the ‘FISKARS’ box. Head to www.fiskars.co.uk to view the full range. ............................................................................................ Address.......................................................................... ............................................................................................. ............................................................................................ Postcode....................................................................... Daytime phone........................................................... Mobile.............................................................................. Email................................................................................ Date of birth................................................................ Only one entry per household please. This competition is open to all UK residents aged 18 or over, excluding employees or agents of the associated companies and their families. One entry per person. The prizes detailed in each competition cannot be exchanged for goods, or towards the purchase of goods at any retail outlet. Entries must be on the coupon provided. It cannot be exchanged for cash, or replaced if lost or damaged. Illegible entries and those that do not abide by these terms and conditions will be disqualified. Prizes must be taken as stated and cannot be deferred. The decision of the judge is final and no correspondence will be entered into. CLOSING DATE 23.02.2017 Winners will be notified after the cover dated month, a list of winners will be available in writing on request from Rachel Tudor, 21/23 Phoenix Court, Hawkins Road, Colchester, Essex, CO2 8JY. Data Protection Your details will be processed by Aceville Publications Ltd (publishers of Sew) in full accordance with data protection legislation. All entries become the property of Aceville Publications Ltd, publishers of Sew. Aceville Publications Ltd and sister companies may wish to contact you with information of other services and publications we provide which may be of interest. Please tick here if you DO NOT wish to receive such information by Post Phone Email SMS . From time to time Aceville Publications Limited will share details with other reputable companies who provide products and services that may be of interest to you. Please tick here if you DO NOT wish to receive such information by Post Phone Email SMS . There’s nothing quite like the hit of inspiration you get from a crafty show, so you’ll love the chance to win one of 10 pairs of tickets up for grabs. You could be enjoying workshops, trade stands, demonstrations and much more at this year’s Craft4Crafters show at the Bath & West Showground, taking place between the 6th-8th April 2017. To enter, tick the ‘CRAFT4CRAFTERS‘ box. Visit www. craft4crafters.co.uk for ticket details. Fabric hampers Stitchers, we’re sure you’ll be no stranger to a piece of fabric or two, but you’re certain to be on cloud nine with this great selection of materials. You can bump up your stash in no time thanks to this fantastic offer from our friends at Minerva Crafts. Four lucky readers will win a £50 bundle of fabrics that is sure to leave them feeling inspired. To enter, tick the ‘FABRIC’ box. Head to www.minervacrafts.com for more products. Sewing goodies Are you in need of a sewing fix, but unsure of where to start? This subscription box will inspire you to try new projects, learn key skills and create stunning garments – right from the comfort of your own stitchy space. One lucky reader will receive a themed box of goodies each month for a total of three months, which includes 2.5m of dressmaking fabric, four fat quarters and a selection of haberdashery items and sewing gifts. To enter, tick the ‘SEWING BOX’ box. Head to www.sewhayleyjane.com for more information. The Dressmaker’s Ball tickets Get your glad rags on and prepare to party at this year’s Dressmaker’s Ball, taking place on Friday 12th May 2017 and hosted by our friends at Crafty Sew and So. Enjoy an evening filled with creativity and glamour at the City Rooms in Leicester to celebrate the rich textile history and modern dressmaking credentials of the city. With a drinks reception, hot buffet, photo booth, catwalk, dressmaking competition and entertainment from Gabby Young, you’re sure to have a fantastic time. Two lucky readers can win a ticket to the event, each worth £48*. To enter, tick the ‘BALL’ box. Head to www.craftysewandso.com for more information. *Please note the prize does not include travel or hotel cost. Fabrics, fabrics and more fabrics! Kawaii Fabrics are offering 10 lucky readers the chance to win one of its fantastic bundles which features beautifully bold printed cottons. Whatever the stitchy project in mind, you’re sure to be bursting with ideas! To enter, tick the ‘KAWAII’ box. Head to www.kawaiifabrics.com for more details. Machine needle gift Machine needles are of course an essential part of the sewing process, and that’s why you’re going to love this fantastic giveaway from John James Needles. 15 lucky readers have the chance to win one of these bundles, which includes everything you need to be a stitchy success! To enter, tick the ‘NEEDLES’ box. Head to www.jjneedles.com for more information. Suppliers of mail order fabrics for over 40 years we source beautiful fabrics from Britain, Europe and rest of the world. * Offer only valid if you buy all fabric remaining on the bolt. Ends 31st January. Your littl’un will love this soft and cosy sweatshirt! Young Jack looks very smart and snug in this cowl necked top, made by his mum Sarah Gledson. The fun puffin print in light blue and yellow will appeal to many kids, but any kind of cotton/bamboo French terry, light sweatshirting, velour or jersey fabric with at least 50% stretch would work well for this garment. Download and print the pattern at www.sewmag.co.uk/templates and cut out out all the top pieces from fabric, and the waist cuffs, arm cuffs and pocket strips from ribbing. Fold one pocket strip in half lengthwise with wrong sides together to form a double layer strip. Place the strip on the right side of the top front, along the edge of one pocket opening. All the raw edges should point the same way. Stretch the ribbing a little, let it hang off the edge at the beginning and end by a few millimetres, and pin. Repeat with the second strip on the opposite side . Place the through-pocket lining piece so that it’s right sides together with the top. If using a directional fabric, your pattern will appear upside down. The main fabric and pocket fabric will be right sides together, with the pocket trim sandwiched in the middle . Sew along the semi-circle curves with an overlocker on a stretch setting or a sewing machine with a stretch or zigzag stitch, using a 6mm seam allowance. Turn the fabric right side out and press the curves. Topstitch the seams just sewn, ideally using a twin needle, and sew with one needle either side of the seam. Alternatively use a zigzag, stretch or long straight stitch . Turn the fabric so you are looking at the pocket lining. Fold the lining down so the top straight edge meets the bottom straight edge. Pin or tack this long edge so all three layers remain together [4-6]. Place the front and back pieces right sides together. Pin and sew at the shoulders with a 6mm seam allowance. The front piece will appear shorter than the back. Press the seam towards the back and topstitch with a stretch or long straight stitch. This seam will now sit towards the front of the body rather than on the top of the shoulder. Place one arm piece, right sides facing, against the top. Start by pinning each end and work your way towards the middle, ensuring it is secured evenly. Sew using a 6mm seam allowance. Repeat for the second sleeve. Place the front and back cowl pieces, right sides together, then pin and sew along the top longer curved edge. Turn the cowl right side out and press. Topstitch 25mm from the edge just sewn using a stretch stitch. Fold the cowl in half and mark the centre of the raw edge of the back. Fold the top in half and mark the centre of the back neckline. Match the mark on the back of the cowl to the back neckline mark and pin in place. Pin around the neckline until you reach one end of the cowl, then pin the other way around the neckline. The two ends of the cowl will overlap across the whole front. Turn to the back of the top. Pin the neck facing to the back of the neckline with the right side of the facing against the fabric of the cowl. The facing should reach almost shoulder to shoulder. Sew the cowl and facing to the top, stitching around the entire neckline using an overlocker or long, narrow zigzag stitch â&#x20AC;&#x201C; taking care to catch all the layers as you sew. Begin and end the stitching in the middle of the back as it will eventually be hidden by the facing. Fold the neck facing down, so it is inside the top with the right side of the fabric facing you. Pin in place. Sew the facing down using a medium straight stitch, 2mm-3mm from the edge of the facing. Pin the top along the arms and down each side, right sides together. Sew from the end of the arm to the bottom of the garment in one go, using a 6mm seam allowance. Fold each arm cuff in half, matching the two short ends, to form a ring of fabric. Sew using a 6mm seam allowance. Fold the bottom half of each cuff up to make a double layered ring. Place one cuff over the end of a sleeve so that all the raw ends face the same way. Stretch the cuff gently, pin evenly around the end of the sleeve and sew in place with an overlocker on a stretch setting, or a zigzag stitch on a regular sewing machine, using a 6mm seam allowance. Repeat for the second arm cuff, plus the waist cuff at the bottom of the garment. Dimensions Owl: 19cm x 26cm 0.5cm seam allowance used throughout. If you’re new to toymaking or just looking for a quick-sew project, these lovely owls by Louise Nichols are sure to satisfy. The pair are made up using a soft flannel fabric, which is ideal for sewing toys that little ones are likely to cuddle up to – Olivia and Ruben certainly enjoyed their owl hugs! The durable cotton also retains its charm after doing the rounds in the wash, so youngsters can play with their new friend to their heart’s content. Visit www.sewmag.co.uk/templates to download and print the templates. Use them to cut two head sections from patterned fabric and two body sections from plain fabric. Stitch the head and body sections together and press open the seam. Draw two wings, two outer eyes and two inner eye sections onto fusible webbing. Cut out and iron the wings onto different patterned fabric, the outer eyes onto beige felt and the inner eyes onto white fabric. section, iron on and machine stitch in place. Repeat for the top scalloped section. Cut out and position the wings and outer eyes. Iron on and with your machine set to a wide zigzag stitch, sew along the inner edges of the wings and around the edges of the eyes. Draw three scalloped sections onto fusible webbing. Iron two onto the same patterned fabric as the head and the third onto the same white as the inner eyes. Use the template to cut two eye middles and one beak from brown felt. Oversew the edges in place by hand, using cream thread. Place the front and back body sections wrong sides together and machine around the edge, leaving an 11cm gap along the bottom edge. Snip and trim the seams, turn through and press. Stuff until it’s nice and soft, not filling too firmly. Using matching thread, hand sew the gap closed. Add a plain baby blue to break up other prints. Perfect for pairing with other patterned flannel fabrics! This soft baby pink is the ideal choice for littluns. Inject a pop of colour with turquoise and gold yellow. Pair this soft mushroom brown alongside brighter hues. Create a girlie owl with this coordinating organic cotton. 100% ORGANIC COTTON Flannel is a soft and fuzzy cotton fabric. It is thick, very durable, and feels warm and cosy in cold weather, whilst the fabric absorbs and releases perspiration – allowing it to breathe during warmer weather! As well as a vast range of dress fabrics, we stock many upholstery fabrics, craft fabrics, wools, embroidery threads, sewing machines, ribbons and a plentiful supply of all the haberdashery and notions you could want. 01726 75385 Patchwork, Quilting, Craft and Dressmaking fabrics and classes, sewing and knitting patterns, wool, haberdashery and Toyota and Pfaff Sewing Machines. Contemporary fabrics, quilting supplies, yarns, haberdashery, Elna sewing machines. Patchwork Parade “Q” House, Russell Street, Chadderton, Oldham OL9 9SH Quality cotton fabrics, threads and haberdashery, kits and patterns. Classes for all skill levels. We stock Haberdashery, Craft fabric, Threads, Ribbons, Craft essentials and sew much more! Large selection of Patchwork & Dressmaking fabrics in stock. Catherine Hill, Frome, Somerset. Somerset Sewing Machines Unit D, Cartwright Mill Business Centre, Brue Ave, Colley Lane, Bridgwater, Somerset TA6 5LT Stockist of Happy Japan Embroidery machines. Come in to find out more. STITCH THESE ON-TREND CACTUS INSPIRED MAKES IN AN EVENING! Cacti and succulents are a popular motif right now and it’s no wonder – as well as being easy to care for in real life, their vivid green colours and wide variety of shapes look great on homewares and accessories. Add a touch of the quirky desert style to your home with these fun bonus projects, available online for FREE now! Traditionally, garments embroidered with goldwork and Irish lace were reserved for royalty and envied around the world. Take part in Sew and So’s exclusive needlecraft retreat at an Elizabethan manor on 3rd-5th February, where you will be taught these beautiful and historic skills. Over the weekend, in the luxurious setting of Cranage Hall in Cheshire, you will learn the intricacies of these techniques – which have been passed down through three generations to tutor Maire Curtis, who has been trained by Hand and Lock and the Royal School of Needlework. In addition, you will get to stitch a lovely sparkly butterfly design on gold flecked evenweave under the instruction of designer Lucie Heaton, adding a cross stitch element to the experience. With all kits, food and accommodation included in the price – £475 for single accommodation and £425 for shared, take this opportunity to meet life-long friends, learn a new skill and most importantly, stitch! To find out more and book, visit www.sewandso.co.uk or call Sheena Culley on 0870 220 0200. Try a great free machine embroidery class with a difference that’s ideal for both beginners and sewers with experience. During this one-day workshop, you will learn a new technique using layers of fabrics that are sandwiched and stitched, before using a soldering tool to reverse appliqué on top. The book wrap will then be embellished with cords and beads. The class is priced £45 and includes a kit with everything you’ll need. Visit www.kisquilting.co.uk or call 01473 722888. On this intensive one-day workshop, priced £70, you will learn all the skills to make a beautiful camisole top and French knickers in soft satin. Both pieces in the set are cut on the bias to create a flattering fit. All materials are included in the cost and you’ll have a selection of satin fabrics and lace trims to choose from. Email Julie Collins for satin samples – once you have chosen your desired fabric, she will cut the garments out in your required size prior to the course. Visit www.seweasybristol.com or email info@seweasybristol.com. Travel to India with Stitchtopia from 8th-13th March for an inspirational 13-day quilting holiday, visiting The Calico Museum of Textiles, the Crafts Museum, the Sanskriti Museum of India Textiles, The Anokhi Museum of Hand Printing and many more. There will also be hand patchwork workshops taught by Pat Archibald, a day with local craftswomen in rural Udaipur, plus a visit to some of the locations featured in the movie The Best Exotic Marigold Hotel. Prices start from £3,895. Visit www.arenatravel.com or call 01473 660800 to book. l Once upon a timeâ&#x20AC;Ś Beauty and the Beast, fairytales and magical sewing! l Part three of our heritage series: we explore the lasting appeal of cotton lawn. l Sew talks maternity sewing! How to dress and stitch for your bump. Sew a spring into your step! 6447 FOUR FAB DRESSES 6163 EASY-SEW WARDROBE Including jackets, tops, skirts and trousers! Claim your FREE* sewing tin! opening to the wrong side of the front seam. This is particularly useful on fabrics that may stretch, to keep the opening from bagging . enough to fit the whole hand inside. The pocket is sewn to the garment before the side seam is stitched. Sew the pockets right sides together to the side seam, then press the seam towards the pocket bag. Under stitch to hold in place. Use a slightly smaller seam allowance so the pocket won't show from the right side . To make a pocket bag shape, simply draw around your hand, facing downwards onto a piece of paper. Draw a straight vertical line across the wrist, then use this outline as your template . Pin the garment pieces right sides together and sew, backstitching at both the top and bottom of the pocket. Use a small stitch to strengthen the seam, remove the pins and either use a zigzag stitch or overlocker . Press, then you're ready to construct the rest of the garment . READ ABOUT DEBBIE'S SEWING SPACE ON P98! Secure the thread on the wrong side of the fabric and work from the top of the stitching line to the bottom. Bring the needle to the surface and take it to the right before pushing it back through the fabric. Bring it back up below and halfway between the first two needle positions. Pass the thread under the needle and pull through, catching the thread. The next stitch is made by taking the needle down to the left and bringing the needle up through the fabric, halfway between the two needle positions. Pass the thread under the needle and pull through, catching the thread. Continue in this manner; alternating the sides until the feathering is worked for the desired length. Secure the thread and working along the edge, bring the needle to the surface of the fabric. Take the needle through from the back of the fabric to the surface on the stitching line. Loop the end of the thread under the needle and pull through to adjust so that the stitch lies along the edge of the fabric. Repeat to create evenly spaced stitches along the fabric edge. Maintain an even tension to avoid distorting the fabric. Secure the thread on the wrong side of the fabric, then bring the needle through to the surface to start the first stitch. Moving forward, take the needle back down through the fabric then bring it up again. Keep the distance between the gaps and the stitches equal in size and continue along the stitching line. The key to successful fitting is taking accurate body measurements and comparing them to those on the pattern envelope in order to make appropriate alterations. preferably in the bra you will be wearing with your garment. l	Use a new tape measure as they can distort out of shape over time. l	Ask a friend to help you, especially with tricky measurements such as your back-neck to waist and height. measurements and remember pattern sizes are totally different to ready-to-wear high street sizes. l	Use your measurements to help you adjust the pattern to fit your shape, not forgetting to take the required ease into account. Around the chest, above the bust and under the arms. Around the smallest part of your waist. From the base of the neck to the natural waistline. Around the fullest part of the bust. Measure standing against a wall. offer tips on decoding dressmaking patterns NEW TO DRESSMAKING OR LOOKING TO LEARN THE BASICS OF PATTERN READING? FOLLOW THIS HELPFUL GUIDE AND YOU'LL BE WHIPPING UP WARDROBE STAPLES IN NO TIME! These basic markings are important to get your head around when using commercial sewing patterns. Often, these will need to be transferred to your fabric in order to finish the project you are working on. Align this mark with the grain of the fabric as you position your pieces. You will find these located at the bust and hip points on the pattern. These small shapes come in a range of sizes and can be placed as points of reference on a pattern. This is an opportunity to customise the pattern to your preferences. Tucks and gathers Match the lines together when stitching. Button and buttonhole placements These indicate the position for placement on a garment. Notches Match two pieces of fabric together at these points. • Fashion Fabrics • Woolens • Worsteds • Polywools • Polyesters • Cotton • Dance Wear • Linings • Bridal Wear • Satins • Suiting EVENTS • Lycra and much, much more! www.pennineoutdoor.co.uk Wide range of water resistant fabrics for clothing, covers, bags etc. Microfleece, sweatshirting and T-shirting, also buckles, webbing and zips etc. *PLEASE NOTE, DIGITAL SUBSCRIPTIONS WILL NOT INCLUDE SUBSCRIPTIONS GIFTS NOR COVER MOUNTED GIFTS. This handy guide to contemporary crossstitching encourages you to embellish anything and everything that isn’t plain white aida. It offers over 30 designs, including bunny baby-grows, a pop art phone case that packs a punch, and a glow-in-the-dark skull design. Each project in Modern Cross Stitch is displayed in a large stitching chart with step-by-step instructions, making it the go-to for crossstitchers of all skill levels. Lizzie King is a tie-dye enthusiast who offers ‘Get Rich or Tie Dyeing’ workshops all over London. She loves anything jazzy and everything 90s, which is reflected in her bright and playful makes. Her brand new book, Tie & Dye, covers the basic techniques of hand dyeing with helpful advice based on her own experiences, plus step-by-step instructions for 12 projects to brighten up your home and wardrobe, from statement T-shirts and dip-dyed shoelaces to shibori pillowcases and Fresh Prince-inspired caps. Why should people tie-dye their own fabric? It’s so much more exciting to dye your own! You have control over the colours and patterns, and get to experiment with new techniques. Every time you open out something you have dyed, you get a buzz from revealing what you have created, which trumps shop-bought every time. What fabrics do you enjoy working with? Giving a handmade present is a really sweet way of showing you care, but it can be a real challenge to come up with a practical, goodlooking gift that will stand the test of time. This book offers the ideal solution with 22 stunning projects – you’re sure to find something for everyone! Even better, you can use up the leftover fabric you have in your stash thanks to Debbie Shore’s tips for making little scraps go a long way. I love cotton, silk, linen – anything natural works really well, whereas synthetic fabrics don’t absorb the pigments very easily. I have dyed wool in the past, which was tricky as it absorbed so much water and got a bit heavy to work with. I also hate the smell of wet wool! What is your favourite project in Tie & Dye? I think it has to be the Totally Tropical Watermelon Bunting, because I love tropical parties! It’s the perfect decoration for a barbecue, and when the weather turns you can hang it in your living room to bring the summer inside! Share your biggest dye-related disaster with us. I honestly don’t think that any tie-dye experiment is a disaster, as you always learn something. Saying that, the first time I tie-dyed I didn’t practise at all and went straight on to tie-dyeing an expensive shirt. I used every colour as I was too excited and made a horrible sludgy brown mess… Then I accidentally shrank the shirt in the wash! Apart from my machine and a good pair of scissors, I couldn't live without Stick and Spray, an adhesive spray that is re-positionable. I refer to it as 'pins in a can!' I use it to hold appliqué and trims in place, and wadding to the back of fabric before sewing – practically every project involves a spray at some point! I started my career in TV back in 1979, so in terms of work it's all I've ever known. I've been both a presenter and actor, on stage as well as TV, so I'm really comfortable in front of the camera. I like to think I've brought a bit of inspiration to the shows on Hochanda! I try and make projects that are simple enough for everyone to try, and my products are designed to make sewing easier. y mum was a talented seamstress and taught me to sew so long ago that I can't even remember when it was. My sister and I used to dress in identical outfits for special occasions, which we loved because they were so unique, and there was never a shortage of dressing up outfits to play in! I've always loved creating anything with fabric, from curtains in a shoe box caravan I made myself and disco outfits for my teenage dolls, through to homewares and crafty items. My family are all very creative – my mum could paint, my dad was an engineer and my sister can both sew and knit. It's always been a part of my life! Having studied at the London College of Fashion, dressmaking is my background. But over the last few years I've lapsed and enjoyed making bags, home décor and crafty items. After revisiting fashion recently, I have to admit I'm enjoying it more than ever! My sewing room looks out over the village green and houses a large cutting table, cupboards full of fabric, threads within easy reach on the wall and a dog bed under the table. Each morning the room starts off tidy, but by the end of the day it's chaos! I have to be very organised – my fabrics filed in colour groups (as are my threads), the scissors boxed together and my cutting mat clean. Initially, my inspiration comes from the fabric in front of me. Pretty pastel shades make me think of feminine projects such as toiletry bags and make up rolls, whereas bright colours are always a fun choice for children and anything sparkly screams Christmas! I visit sewing and home shows to pick up on trends and spend a lot of my time in antique and vintage shops, where I take inspiration from the past.